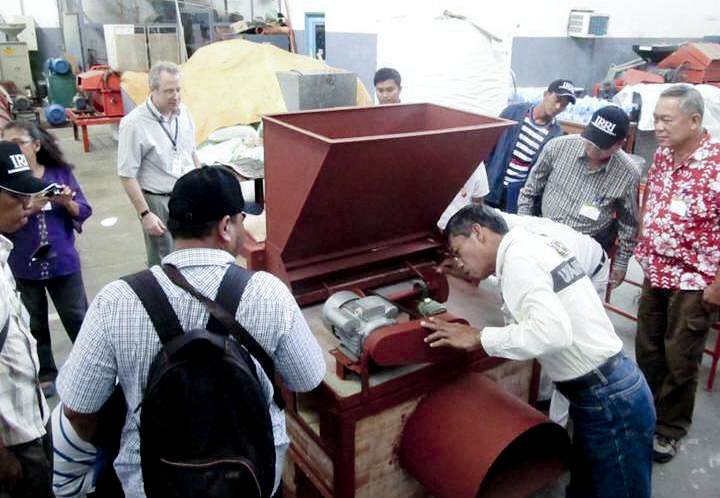 IRRI-developed downdraft rice hull furnace technology works. Sixteen participants from Cambodia, Indonesia, Myanmar, and the Philippines completed the training on the new IRRI-developed downdraft rice hull furnace (dRHF) technology, held on 25-27 September 2012. Trainees, which included dRHF pilot-testing cooperators, manufacturers, and Learning Alliance partners, were taught the proper operation of and fabrication procedures of critical components of the dRHF, including the combustion grates and ram drive assembly as feeding mechanism. Participants were also given a demonstration of fabricated components in actual use (photo) in a batch recirculating and flatbed paddy dryer. Martin Gummert, IRRI postharvest specialist, led a discussion on intellectual property concerns between IRRI and clients, with emphasis on licensing. Pilot-test cooperators and first users of the technology also shared about their ideas and experiences. IRRI's Pat Borlagdan answered questions from the participants relating to the components of and operation of the dRHF. The training was part of strategy to commercialize the technology and was funded through IRRC's Post-Production Working Group and the IRRI-ADB Postharvest Project, both managed by Engr. Gummert.